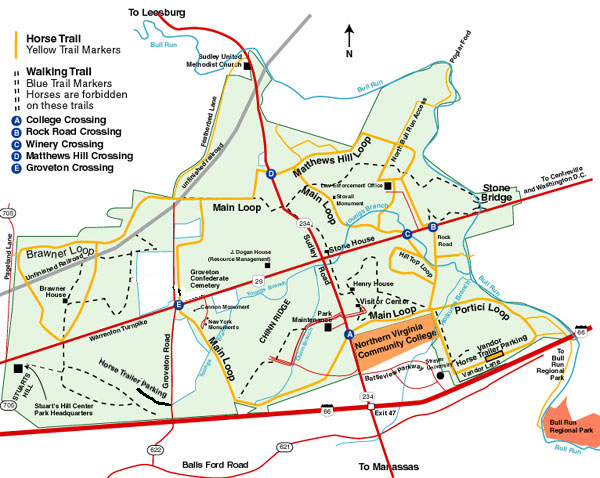 The Manassas Battlefield provides over 21 miles of developed equestrian trails for your riding enjoyment. You must provide your own mount (there are no horses available for rent or lease on the Battlefield). The official Manassas Battlefield brochure's modern map does not show the equestrian trails or the designated horse trailer parking lots. Obtain equestrian trail maps at the Henry Hill Visitor Center, or download the Equestrian Map below. We will try to keep our Equestrian Map current. If in doubt, check with the Rangers at the Henry Hill Visitor Center for current trail status, and always observe trail signage whenever you are riding in the Park. Small round yellow disks are used to mark equestrian trails. Blue disks warn that you are riding on a hiking trail. Park Rules: Please, unload or load your horses within the Park only at designated Horse Trailer Parking Lots (currently, the Groveton Road or the Portici Lots). Please, ride only on the designated equestrian trails. These restrictions not only protect the integrity of the Battlefield, but are necessary for you and your horse's safety (aside from normal off trail hazards, we have a healthy population of ground hogs and numerous archaeological trenches have been dug throughout the Park). Park hours are from dawn to dusk. Brownsville Horse Trailer Parking: This parking lot is located on Groveton Road. We recommend using this lot for unloading and loading your horse(s). This lot has restroom facilities and a picnic area as well as large spaces for trucks and trailers. Portici Horse Trailer Parking: This parking lot is located on Vandor Lane which is a continuation of Battleview Parkway bordering the southeast quadrant of the Battlefield. Use the bridle path that parallels Vandor Lane in the fields on Park property. We do not recommend riding on Vandor Lane.